Her Fierce Warrior is the fourth full length novel in Paige Tyler's X-OPS series. I would suggest reading these books in order, starting with the prequel to the series, Her Secret Agent. Minka Pajari was a monster. She had been made a monster by monsters. Monsters who wielded syringes had changed her to where she now grew fangs and claws. She was scared, didn't know where to go, but when she was in Angelo's arms, she knew she was safe. Angelo Rios had seen some unusual, surprising, and secret things. And that was just in the short time he'd learned about the Department of Covert Operations. He was Special Forces, but had helped his friend on a mission with other DCO operatives. Angelo was back with the team in Tajikistan when he encountered something he never expected to see again. A hybrid. Female. Dangerous. And only he had the ability to calm her. However, when they reach the DCO, they learn that some threats are more insidious than pitchforked villagers. Minka was a hybrid. Not a shifter, natural with her abilities. Instead, she'd been kidnapped, tortured and forced to have these changes. Angelo, however, would stick close to Minka. He kept her calm. He would keep her safe. And maybe, he would just keep her for himself. 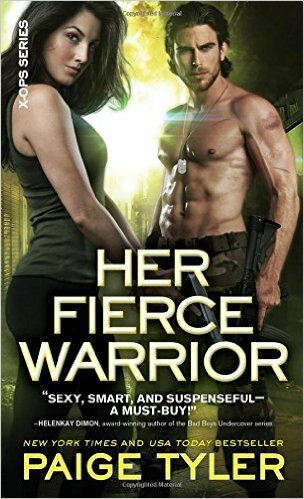 Her Fierce Warrior brings two longtime characters together in a very unique setting. We had met Angelo at the beginning of the series. He had helped his best friend. We had seen snippets of Minka's experiences and knew she was in danger. Now, readers get the thrill of seeing these two fascinating characters come together and challenge anyone who dares cross them. On a sad note, Angelo was named for the cover model Angelo who died a couple of years ago. I did have the opportunity to meet him, and am happy that Ms Tyler chose him as inspiration for this hero.